It’s no secret that kids love the bad guys in Disney films – and who can blame them? While the film’s stalwart doofus is getting maneuvered into another obvious trap, the villain is hatching some evil scheme, breaking all the rules, and buahahaing with the best of them. If the good guys are the nutritional veggies that hold the story together, villains are the dark cinematic chocolate that makes it all worthwhile. How many times have we sat through some sappy lovey-dovey duet just so we could get to a kickass villain song? Whether you prefer your dastardly figures wide-eyed and psychotic or restrained and scheming, we all love us some evildoers, and quality baddies are as much of a Disney tradition as the mouse ears or happily-ever-after. This May, Disney is giving Maleficent from Sleeping Beauty the Wicked treatment as the protagonist of her own film. Promotions for the film have been fierce, with early trailers even calling her “Disney’s greatest villain.” But what is it about some members of Disney’s rouges gallery that makes them stand out more than others? What sets certain miscreants into a category all of their own? 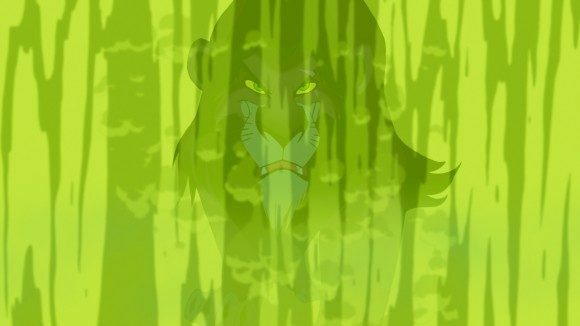 What makes a great Disney villain? Cruella de Vil from 101 Dalmatians is many things. She’s a high-class fashionista. She’s a wealthy socialite. She’s a sophisticated aristocrat. She’s a greedy, merciless psychopath. 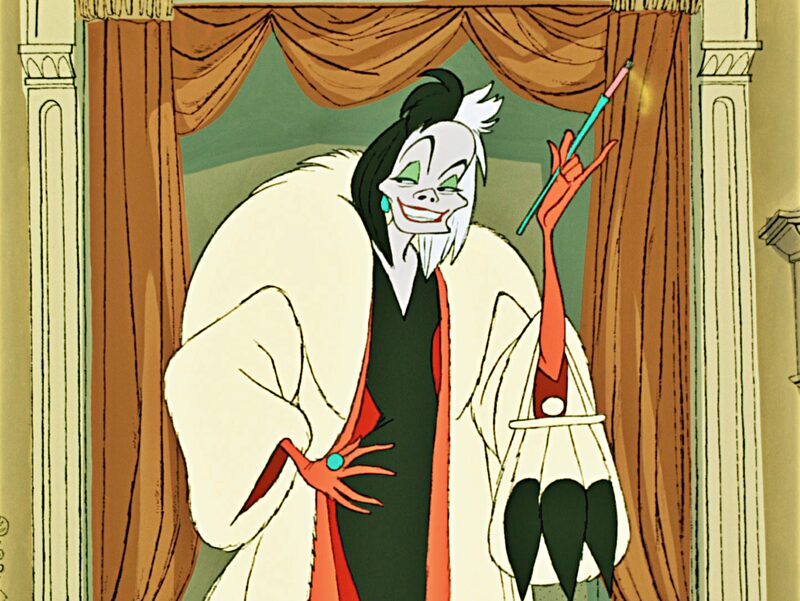 Cruella is a great character in part because of how she brings together elements from very different worlds. Her character could have just as easily been limited to one side or the other, but her impact would have been diminished. 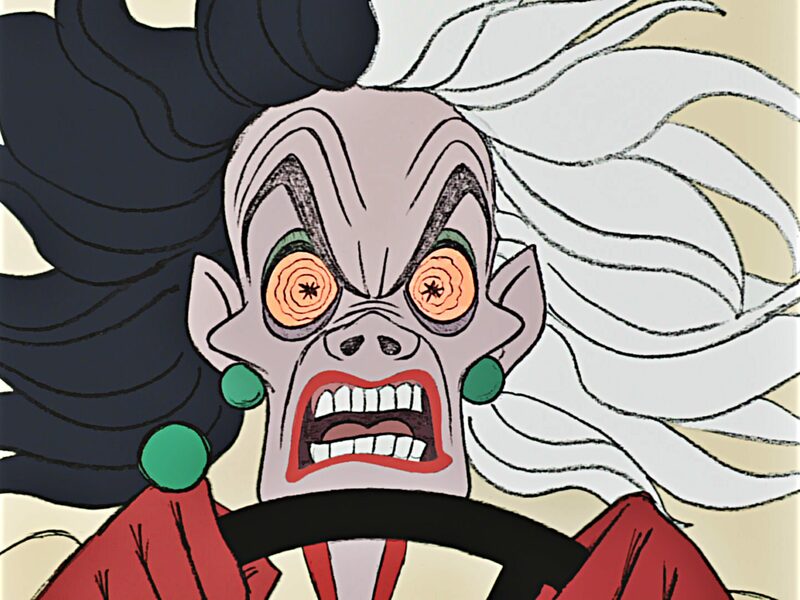 It’s not the high-class lady or the unhinged lunatic that makes Cruella so interesting, it’s her perfect combination of the two into a high-class lunatic. Compare her with Shan Yu, the main antagonist in Mulan. Speaking in objective terms, Shan Yu might be considered more insidious than Cruella: he murders countless innocents, burns down villages, and generally goes through his plot to destroy China in sadistic high spirits. You know what else he is? Totally uninteresting. Shan Yu lives on the same monotonous note of destructive warfare in every scene in the film, and our interest in that wears out fast. Does this mean that Mulan is a lesser film? Not at all. Each character is used in a very different way: Cruella as the protagonists’ direct opponent, Shan Yu as a trigger that puts Mulan on a collision course with ancient China’s gender politics. They each get the job the film has for them done, but Shan Yu’s effectiveness doesn’t make him any more exciting or memorable. But a character like Cruella? She’s an unpredictable hurricane, you never know what face she’ll show next. She’s an overbearing houseguest, she’s a scheming liar, she’s an impatient boss, she’s flying off the handle. She can be evil on a variety of levels – that’s what makes her irresistible, both as a baddie and as a character. A good villain character sets the plot in motion – a great one is firmly in the driver’s seat for every situation the movie throws at him (or her). There’s never a point in Aladdin where Jafar is not in absolute control of what’s happening around him. Whether he’s hypnotizing sultans, manipulating street rats to do his bidding, or lying to gullible princesses, he is always ruthlessly maneuvering everything and everyone around him to further his purposes. Even when things don’t go his way, he’s always quick to course-correct and get back on top. Lamp gets sealed in an impenetrable cave? No problem, he’ll just marry the princess and become sultan. New prince shows up and tries to beat him to the altar? Better go have him assassinated, posthaste. Genie working for rival? Don’t worry about it; he’s already got a plot to steal that lamp. This is part of what makes the third act of Aladdin one of the greatest final battles of the Disney Renaissance – after an entire film of being in figurative control over everything that is happening around him, Jafar’s magic powers give him literal control over the world. How do you beat someone who can rewrite the physics of the universe around you? 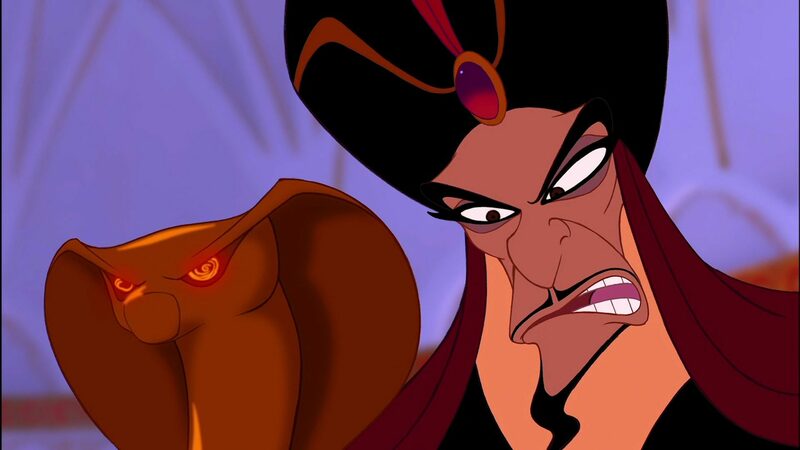 Unlike other villains who lose their steam once they achieve their goals, the things that make Jafar threatening just get more complicated and more dangerous once he gets what he wants. So you’ve managed to kidnap the princess, destroy the army, and take over the castle? That’s great… but what have you done to the hero’s mental health? A truly great villain understands that physical victories are nothing compared to getting under the hero’s skin. Are you dastardly enough to get Mr. Goody-Two-Shoes to start doubting himself? Can you crush him mentally to the point where he is no longer an effective threat to your evil plans? This is why Ursula tries to destroy Ariel by seducing the man of her dreams away from her, or why Jafar publicly exposes all of Aladdin’s lies. But the undisputed champion in this field is, of course, Scar from The Lion King. Killing Mufasa via stampede is brutal enough, but convincing innocent cub Simba that he’s responsible, and getting him to abandon his family and friends? Now that’s evil. There’s a certain amount of shock and awe that goes into a great monster. The forces of evil need to seem overwhelming and disturbing, more than what the naïve heroes could ever hope to overcome. Great Disney villains need to make an impact with how terrifying they are… but they have to be a very particular kind of terrifying. Working within the confines of Disney means that you are limited to what you can show in a G or PG rating, and to an arsenal that does not contain the explicit violence that filmmakers often fall back on to establish how heinous a character is. So what do you do? You move into different kinds of scary, a creepy that is more divorced from the real world. You move the terror into the realms of the iconic, or the mythological, or the fantastic. You refocus the violence so that it captures the audience’s imagination and sets it on fire. This is where a villain like Maleficent finds her niche. She is (at least in Sleeping Beauty) a completely, unapologetically evil creature, a wicked fairy who spends the entire film plotting murders, cursing innocents, and commanding the forces of evil. It’s no accident, then, that she is one of the least human characters in Disney’s rogues gallery. She’s designed to look like a bat with devil horns, her instances of violence all rely on supernatural powers, and she surrounds herself with inhuman, hog and bird-like minions. While the good magical characters in the story retain very human appearances and attitudes, the more we see of Maleficent’s insidiousness the more she is steeped in fairy tale and fantasy imagery. At the height of her evil fury she even abandons all semblance of humanity and takes on the form of a fire-breathing dragon! Sleeping Beauty is never timid about making its villain terrifying, but it also knows how to place some distance between its scary side and viewer’s real life. The characters that look like real people are all noble and virtuous, while the bad guys all looks like things that stay safely locked away in movies and storybooks. Great Disney villains work with this balance, and strive to bring kids an experience that is scary and thrilling without veering off into the realm of trauma. The difference between a good’s kid film and a great kid’s film is that the former brings a subject matter down to a kid’s level while the latter offers kids a way to rise up and engage with a subject matter that is normally above them. By dramatizing complex topics, films offer children a door into matters that are not normally a part of their day-to-day to lives. In a time of their lives when almost everything is being broken into black and white, movies allow kids to confront and learn from things that are more complicated, more subtle, more adult. And that brings us to Judge Claude Frollo. The main antagonist of The Hunchback of Notre Dame is a treasure trove of villainous attributes. He’s a corrupt judge that psychologically cripples his innocent ward and wages a genocidal crusade against the gypsies population of Paris, all while having his psyche torn apart by his unholy sexual desire for one of the gypsies he is hunting. What made Disney look at that particular package and go, “Yep! That’s our guy!” is more than a little puzzling, but it was an inspired choice. Frollo is a villain that offers a new approach to the task of being a Disney villain. 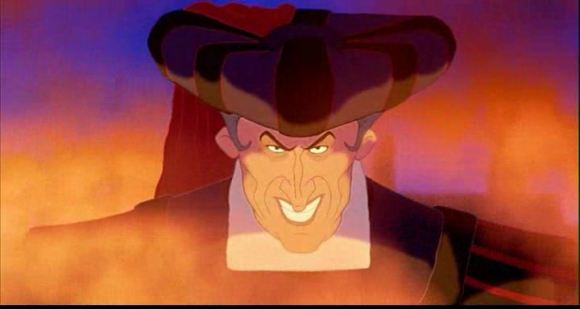 The distance between movie evil and real life that is so present in a character like Maleficent is absent from Frollo. He looks, sounds, and acts like a human being. The things that make him monstrous are extremely human, and this film challenges its audience to reckon with evils that are very much a part of the real world. Ethnic prejudice, sexual obsession, religious extremism… The subtleties of these subjects may be above children’s understanding, but this does not mean they can’t be dramatized in a way that makes them unsettling and scary. The truly great Disney villains don’t talk down to their audience just because they’re kids; they introduce new and complicated forms of evil in a way that is innovative, recognizable, and terrifying. This, more than anything else, is what makes a Disney villain great: he or she challenges the audience. The bad guys that stay with us are the ones that push boundaries and take us to new, complicated places. But now one of these great villains is taking up the mantle of a protagonist. How will Maleficent fare as the star of her own film? Well, the answer to that question may well come back to these qualities we’ve been discussing. Will she be a layered character, with many different dimensions and qualities? Will she be an active protagonist, constantly driving the plot forward and as focused on getting mental victories as she is on physical ones? Will she be terrifying, either in a way that balances it out with how sympathetic she is or in a way that challenges the notions of what a protagonist can be? In short, how great of a protagonist Maleficent will make may come down to how great of a Disney villain the filmmakers are willing to make her. We’ll find out on May 30th.